I grew up in an East Indian home. 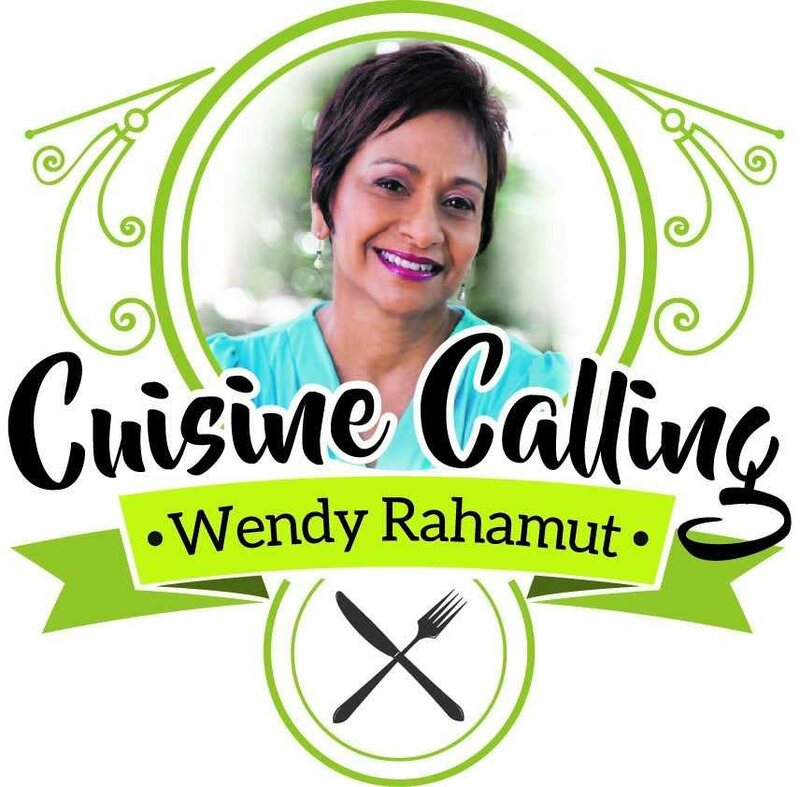 We typically enjoyed Trini cuisine coupled with a good dose of international cuisine as well. My mom enjoyed preparing different types of cuisines for us and she was also a very good cook; my dad enjoyed food immensely and so welcomed any type of different flavour. However, we also enjoyed very traditional Trini-style Indian dishes as well, some of these at that time were probably not served in non-Indian homes. One particular dish I remember clearly was curried eggs with potatoes and hot sada roti. This was served up quite often, and although many traditional Indian dishes have made it mainstream since, like chokas and fried vegetables as fillings for sada roti, curried eggs and potatoes still remains a dish served up in East Indian households. It is a dish that may sound unappetising to most, but it’s comfort food to many. The eggs are first hard-boiled, cooled and shelled. Then they are fried until the whites become dark caramel in colour and the texture becomes like broken bubbles. The potatoes are then curried with enough gravy. 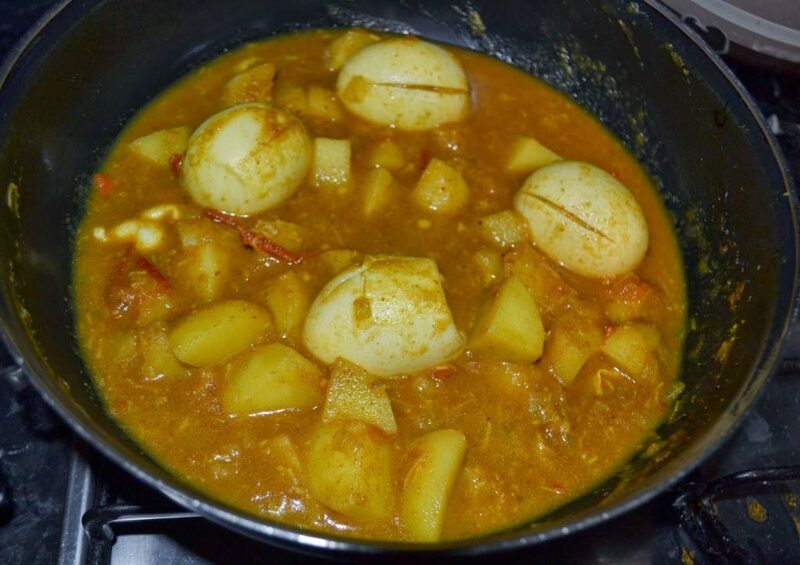 The eggs are then placed with the curried potatoes’ and cooked for a few minutes more. 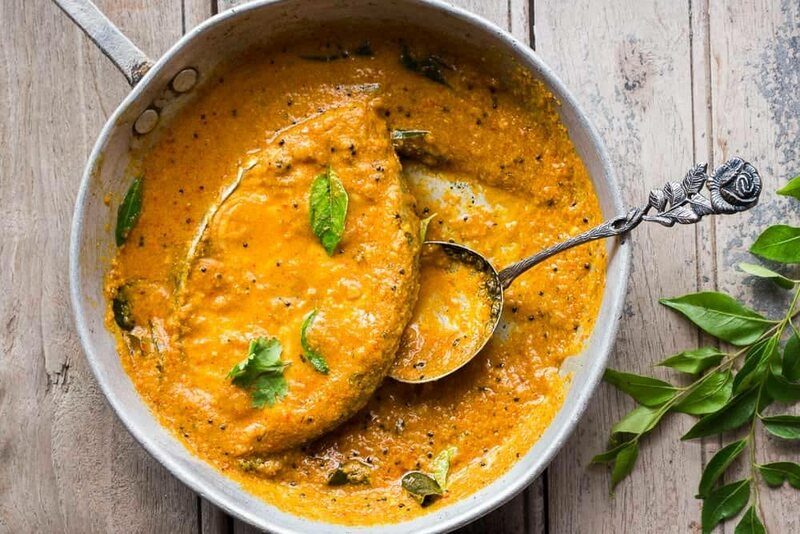 The dish must be saucy enough to enjoy with the sada and also to allow the egg yolks to absorb some of the curry gravy once they are cut into. In a medium sized sauté pan, heat 2 tbs oil, add garlic, onion, and peppers, cook until fragrant. Combine curry powder with water, add to pot, it should sizzle, cook until the water has evaporated, and the curry becomes very aromatic. Add potatoes, stir to coat well with curry mixture. Now add about one cup of water and let the potatoes simmer until tender, about 15 to 20 minutes. Meanwhile fry the eggs, heat 2 tbs oil in a frying pan, dry the eggs thoroughly and place in hot oil, they will sizzle and spit. Roll them around in the hot oil until they are golden in colour. When dark golden remove them and drain them on paper towels. Check the potatoes, if they are tender, and there is sauce in the pot, place the eggs, cover and cook for about 5 minutes, if you need to add more water, do so before adding the eggs. Serve hot with mango kutchela and sada roti. Combine flour with salt and baking powder, rub butter into flour. Turn dough onto a lightly-floured table and knead until smooth. Divide dough into 4 pieces. Round each piece of dough into a smooth ball. Cover with a damp towel and let rest for 15 minutes. Heat a baking stone until hot. Roll out dough to about ½- inch thickness. Place on heated baking stone, cook until small bubbles appear on dough. Turn over roti and continue to cook for about 4 minutes longer. Using pot holders or a towel pull the baking stone away from the fire toward you to expose the open flame or heat element. Push the roti onto the open flame and swiftly turn around so that the roti begins to balloon. Shift the entire roti so that it comes in contact with the flame and balloons. Remove from heat and wrap in towels. Repeat for other three rotis. Clean and wash fish slices remove the small whitish substance from the side of the bone. Sprinkle slices lightly with salt and black pepper, season with garlic and herb marinade. Marinate covered in the refrigerator for about 30 minutes. In a medium sauté pan heat oil and add, onion, pimento and hot pepper sauté until fragrant about one minute. Mix curry powder with water and add curry powder, stir to mix. Add to pot and stir and fry until mixture is very dry, now add the fish slices, and cook for about 4 minutes on each side basting frequently with sauce, cover and simmer, the fish will release some juices, cook for a few minutes more. Steam mango for 5 minutes until tender, drain. Now add the green mango or tamarind and simmer for about 5 minutes more. The mango will be tender, taste and adjust flavours, add Spanish thyme or chadon beni cook for one minute more. Remove from heat, adjust seasonings, sprinkle on lime juice and serve.